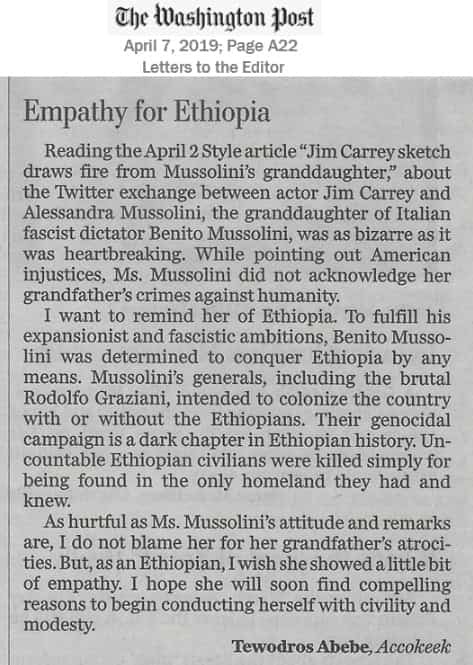 Reading the April 2 Style article “Jim Carrey sketch draws fire from Mussolini’s granddaughter,” about the Twitter exchange between actor Jim Carrey and Alessandra Mussolini, the granddaughter of Italian fascist dictator Benito Mussolini, was as bizarre as it was heartbreaking. While pointing out American injustices, Ms. Mussolini did not acknowledge her grandfather’s crimes against humanity. I want to remind her of Ethiopia. To fulfill his expansionist and fascistic ambitions, Benito Mussolini was determined to conquer Ethiopia by any means. Mussolini’s generals, including the brutal Rodolfo Graziani, intended to colonize the country with or without the Ethiopians. Their genocidal campaign is a dark chapter in Ethiopian history. Uncountable Ethiopian civilians were killed simply for being found in the only homeland they had and knew. As hurtful as Ms. Mussolini’s attitude and remarks are, I do not blame her for her grandfather’s atrocities. But, as an Ethiopian, I wish she showed a little bit of empathy. I hope she will soon find compelling reasons to begin conducting herself with civility and modesty.